Home / Shop / Electromagnetic Radiation Testers / Cornet ED88TPlus electrosmog tester [RF/LF/E-field], FREE SHIPPING! Cornet ED88TPlus electrosmog tester [RF/LF/E-field], FREE SHIPPING! The new Cornet ED88TPlus is highly-recommended as cost-effective, high quality and easy-to-use, all-in-one radiofrequency (RF) and low-frequency (magnetic/LF/Gauss) and e-field digital testing meter. CURRENT SPECIAL — Order by April 15 and get a free DVD of Take Back Your Power 2017! E-field mode: measured ELF electric field strength is shown on the digital LCD display with V/m. Tri operation mode: RF power meter mode, LF Gauss meter mode and LF E-Field mode. Shows the broadcast frequency (100MHz – 2.7GHz) range. Sampling rate: 10,000/sec. Display update rate: 2/sec. Why is Take Back Your Power getting behind this product? 1) Spread of awareness. 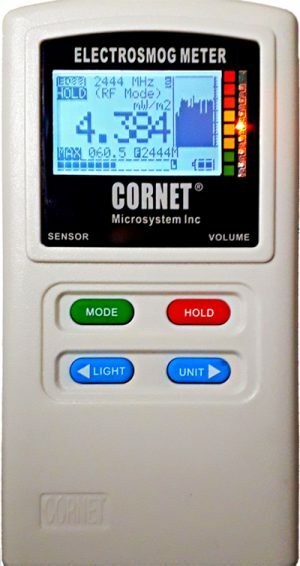 Instantly determine and visually prove the intensity of pulsed microwave radiation from “smart” meters. The more people are equipped with testers, the faster awareness spreads. 2) Partial proceeds fund our work. You can also buy from our friends emfhelpcenter.com, emfanalysis.com, norad4u.com, electricsense.com, and other outlets. But do get a testing meter if you can! Cornet ED88T electrosmog tester [RF/LF/E-field], FREE SHIPPING!